Using Manual setting, set Instant Pot to High Pressure for 3 minutes. Once 3 minutes is completed and Instant Pot beeps, Quick Release pressure and remove eggs as soon as the pressure pin drops. Place eggs in ice water bath until cooled. Set Instant Pot to Saute function on normal heat. Heat sesame oil, garlic and ginger, 1-2 minutes. Add sliced mushrooms, followed by water, soy sauce, 2 teaspoon of kosher salt, several turns of freshly ground pepper and chicken to pot. Stir in noddles and let cook for about according to package directions. Once noodles are cooked, stir in chicken meat, carrots and spinach. 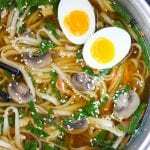 Garnish with soft boiled egg and a sprinkle of sesame seeds. This recipe is for a 6 QT or larger pressure cooker.